There’s nothing worse for a vegetarian to be in a Chinese restaurant and see a luscious platter of mapo tofu being taken to another table and then when you try and order it, you’re told it isn’t actually a vegetarian dish. All that glorious tofu and they have to ruin it by throwing in a whole heap of ground meat. To add insult to injury, when you do order the vegetarian version, what you generally get is a messy tofu vegetable scramble. As far as I’m concerned, mushrooms, peas or, god forbid, baby corn have no place in a classic mapo tofu. 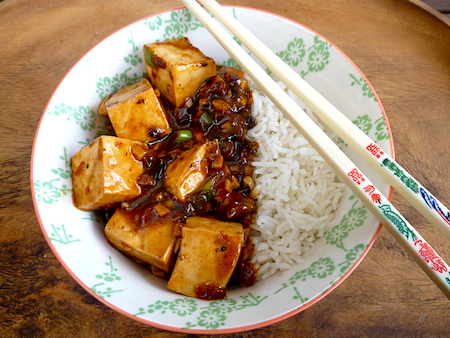 So when I first came across Fuchsia Dunlop’s vegetarian mapo tofu from her latest book Every Grain of Rice: Simple Chinese Homestyle Cooking, it was love at first sight. There was none of the usual mish-mash of veggies to take away from the sumptuous elegance of the classic mapo tofu. But despite being slightly obsessed about trying this recipe, it still took me a couple of months to get around to actually making it. I had to get two new and exotic ingredients (fermented black beans and Sichuan pepper paste) as well as overcoming my anxiety about cooking Chinese food at home. It’s not that I don’t cook Chinese food at home – I make all the usual Aussie–Chinese standards; stir fried tofu, vegetable and noodle dishes – but it’s not really a style of cooking I’m familiar with or that comfortable with and I never feel like I’m doing it ‘right’. Every Grain of Rice is the best book I’ve read on Chinese food – it brilliantly outlines the general principles of Chinese home-style cooking in a way that is accessible and understandable to the average western home cook. A lot of Chinese home cooking is also vegetable and grain-based, so many of the recipes in this book are already vegetarian or can be adapted to vegetarian. After reading Fuchsia’s book, I was completely converted to the frugal, simplicity of Chinese cooking and was inspired to make more of these simple, homely dishes part of our family meals. The first dish I tried was, of course, vegetarian mapo tofu and it was a an absolute winner. The magic ingredients in this recipe – fermented black beans and Sichuan chilli paste – give a depth of flavour that is unlike anything else I’ve encountered. 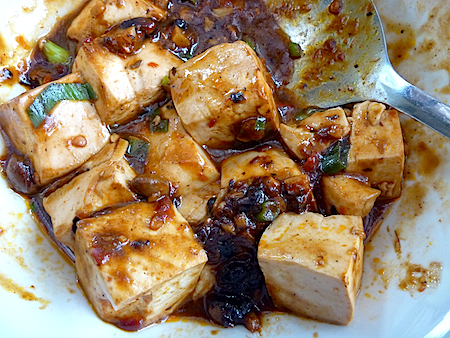 In her head notes for this recipe, Fuschia tells of a vegetarian friend who has made this mapo tofu every week since she first showed how to make it ten years ago. I’ve found it similarly addictive and it’s been on regular rotation at our house since I first starting making it a month ago. Served with greens and rice, it’s a completely satisfying meal in itself but is also a good base to try different dishes and build up your repertoire and familiarity with Chinese cooking techniques. This dish is best made with the softest tofu that will hold its shape when cut into cubes and braised. There are two ingredients that may be unfamiliar to you – the fermented black beans and the Sichuan chilli bean paste. For tips on finding the best Sichuan chilli bean paste, read Fuchsia’s interview with a Sichuan chef here. After reading this, I went to my local Chinese supermarket which had a choice of three chilli bean pastes. After dismissing the Lee Kum Kee mapo chilli paste (which is considered fairly inauthentic by Sichuan cooks), I had a choice between two brands: Royles and Fu Chi Chilli bean sauce. Both of them had a richer, red colour than the Lee Kum Kee brand and a similar ingredient list. Eventually, I chose the Fu Chi brand mainly because it was more expensive, so I thought it might be better quality. The other ingredient which may not be in everyone’s pantry is Sichuan peppercorns. Fuchsia suggests roasting up this in small amounts and using it within a few days. It is true there is a bit of loss of flavour but I make a Sichuan salt mix from Kylie Kwong’s Simple Chinese Food (which is also a great book on home style Chinese cooking but not so vegetarian friendly). We’ve had this salt mix as a staple in our house for a few years now. I use it on everything, from pan-fried tofu, stir fries, braises, boiled eggs and popcorn (it’s really, really good on fresh popcorn). I’ve included a recipe for Sichuan pepper mix below for you to try as well. Cut tofu into 2 cm cubes and place in a pan of very hot, salted water while you prepare the rest of the ingredients (do not let the water boil or the tofu will become tough and porous). Finely slice the green parts of the baby leeks or spring onions at a steep angle. Heat wok, add oil and reduce heat to medium. Add chilli paste and fry until oil is a rich red color and smells fragrant. Then add black beans and ground chillies (if using). Stir fry for a few seconds then add garlic and ginger. Take care not to overcook seasonings, reduce heat if necessary and let seasonings sizzle until the sauce is rich and fragrant. 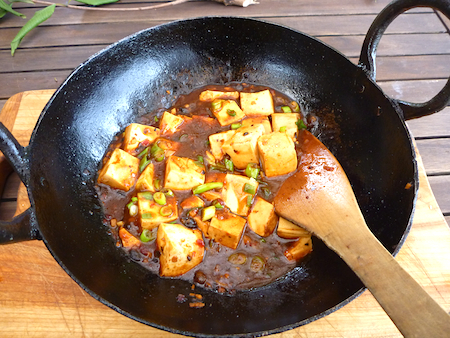 Remove the tofu from water with a perforated spoon, shake out excess water and add gently to the sauce, pushing the tofu gently through the sauce and taking care not to break up the tofu. Add stock or water, white pepper and salt and mix gently, bring to a gentle boil and let simmer for a few minutes until tofu has absorbed the flavours of the sauce. Add the leek slices now (if you are using them) and simmer until they are tender, then gradually add as much of the cornflour mixture as needed until the sauce thickens and clings nicely to the tofu. If you are using spring onion greens, add these now and stir them gently through the tofu and sauce. 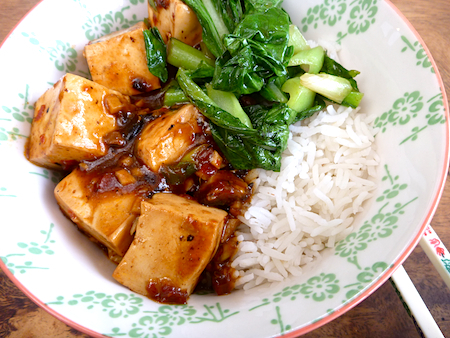 Pour tofu into a bowl, sprinkle with Sichuan pepper and serve with rice and greens. * At my local Chinese supermarket there’s so many brands and grades of tofu it gets a bit confusing. I usually just buy a packet with a braised mapo tofu like dish on the wrapping. Last time I bought pressed silken tofu which is slightly sturdier than the plain silken tofu and that worked really well. Feeds 2–3 people with greens and rice. Roast peppercorns and salt in a small cast iron pan, until pepper smells fragrant and begins to ‘pop’, and then take off heat. Cool, grind to a powder in a mortar and pestle or spice grinder. Beautiful photos Elizabeth! Such gorgeous colours. What brand of tofu do you recommend for this recipe? I just buy the tofu in the plastic tubs from my local Chinese supermarket, they have the biggest range. If you can only access tofu from the supermarket just get the ones in the tubs rather than vacuum packs, silken tofu is too soft but the regular to firm is okay. What a beautiful dish and great post. Thank you for putting this together! That looks delicious! I love mapo tofu but never knew what was required to make it at home, but if I can get my hands on all these ingredients then I will have to give it a try! Thanks for sharing! You definitely have to make a trip to a Chinese supermarket to get some ingredients but once you have them this dish is so easy to make. I generally make it as a quick weeknight meal and it’s just fantastic. When I went to the Chinese supermarket to restock my chilli paste I bought two jars because you tend to rip through it when you make this dish regularly. This dish looks delicious Elizabeth. I get a bit annoyed with some of the “added extras” you get in Chinese food too. Home-made’s the safest way to go 🙂 I love this recipe. Will have to look out for the cook book.. Absolutely awesome recipe Elizabeth!!! Had a bit of trouble finding the Sichuan paste but got it eventually. I’ve tried making Ma Po before with short cut jar junk ready made sauce but to no avail. My wife makes a great one but tames it down for the kids. You’ve definitely nailed it! Thanks for sharing. Yes it is a bit of a bother tracking down the Sichuan paste because I make this dish regularly I usually buy two jars of it at a time. I needed a tofu dish to make tonight, and I’ve been looking up Dunlop recipes online, as I’ve yet to buy her book. This will be our dinner tonight. Thank you! This will be our dinner tonight! I really think I need to get this book. I love all Fuschia Dunlop’s books but Every Grain of Rice is particularly good for simple vegetarian Chinese food. I just tried your recipe! I think next time I will leave out the chili powder though, almost blew me away! Also wish I didn’t miss the note on brands of chilli sauce, I went with what you didn’t recommend and it definitely detracted from the dish.